Missy Gilliland grew up in a hunting family. 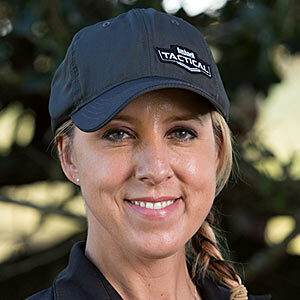 The competitive shooting bug didn’t bite her until she attended a 2012 match in Tennessee with her husband, retired U.S. Army Master Sergeant James Gilliland. Missy tagged along to spend some quality time with James, as well as get some photos of him in action. “It looked like so much fun. At first I thought it was just for law enforcement and military folks,” Missy said. “I went out to the range with him two weeks later, and it was so much fun plinking little things at a distance. “I did a team match with him and I was just hooked on it. When you’re hearing steel ring and you can’t see it with your naked eye. It was something I wanted more of.” Lately, Missy has begun to load her own ammo for competition to gain further accuracy. But the competitive fire still burns – Missy makes sure none of James’ reloaded ammo gets into her gear bag.